In recent months, the Union of European Football Associations or UEFA has made international headlines thanks to continuing scandals about secret bank accounts, mysterious money transfers, and insider trading. 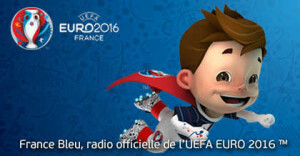 While efforts continue to get to the bottom of this seemingly endless quagmire, plans are well underway for the UEFA Euro games to be held in 2016 in France. As a part of the planned festivities, the UEFA organizational team asked names and sports enthusiasts to name the new soccer/football mascot. Voters were asked to select one of three different names for the adorable brown-eyed superhero cloaked in red, white, and blue: Driblou, Goalix, or Super Victor. After all of the votes were counted, a clear onomastic winner emerged. Out of the more than 100,000 votes received, the name Super Victor was chosen by an impressive 48% of voters. ← House Beautiful: Name This Color!